Compost improves the soil’s structure by creating perfect pore spaces. Working compost into clay-rich or hard, compacted soils make them more porous and water absorbent. It can also make super-porous, sievelike, sandy soils hold onto water. Compost achieves this by helping form aggregates, combining with bits of sand, silt, and clay that stick together in small clumps. Between the aggregates are pores (tiny air pockets and pathways) that allow water to enter the soil and pause there, thus decreasing runoff, erosion, and evaporation. This means that you’ll have to water your garden less as your soil stores more water longer. Soil consists of organic (once living) material called humus, along with inorganic material like rocks and minerals. But healthy soil is also home to a range of organisms, including amoebas, insects, earthworms, bacteria, and fungi. These creatures live in complex relationships with both soil and plants to make nutrients more available and help our gardens thrive. They’re also kind of sticky and slimy, which helps those soil aggregates to form. And no tilling is required; feel free to use compost as mulch! These living things will soon migrate to surrounding soil, spreading the benefits of compost far and wide. As climate change demands that we revolutionize urban infrastructure and water use, we garden stewards are poised at the forefront of these efforts. BBG’s inspirational new Water Garden, which collects and recirculates rainwater, will reduce the Garden’s use of municipal water from 22 million gallons to less than 1 million gallons per year. 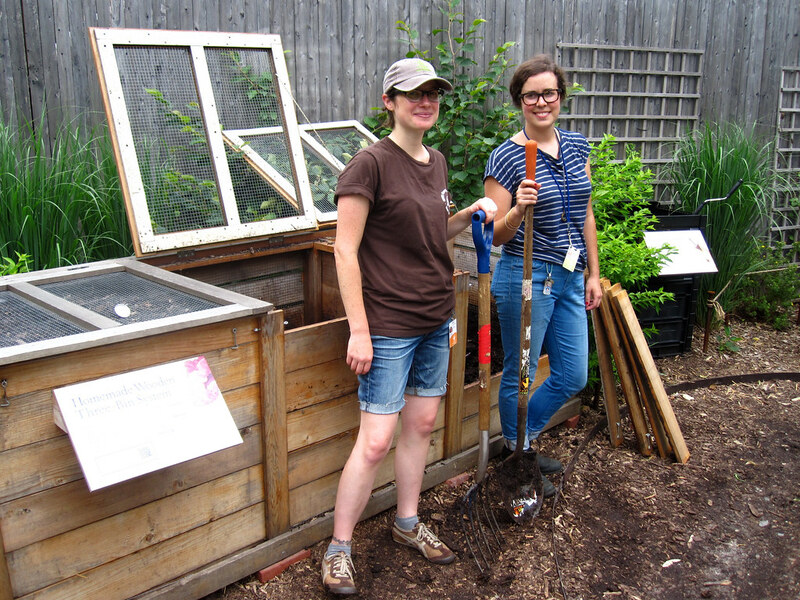 The NYC Compost Project hosted by BBG provides technical assistance to composters in Brooklyn, empowering them to make their own compost and use it to grow healthier urban soils. We’re happy to help you make the soil–water connection in your community. Aaron Lee is outreach coordinator for the NYC Compost Project Hosted by Brooklyn Botanic Garden. Staff and volunteers demonstrate composting techniques at BBG. Photo by Elizabeth Peters.